Every year during Diwali, my MIL makes Maida Burfi without fail. She calls it as Maida cake (All purpose flour sweet cake in English). Usually Tamil people mention burfi recipes as cake. For Diwali, many people especially South Indians love to try sweets recipes made from maida like burfi, badusha, sweet samosa, sweet maida biscuits etc. 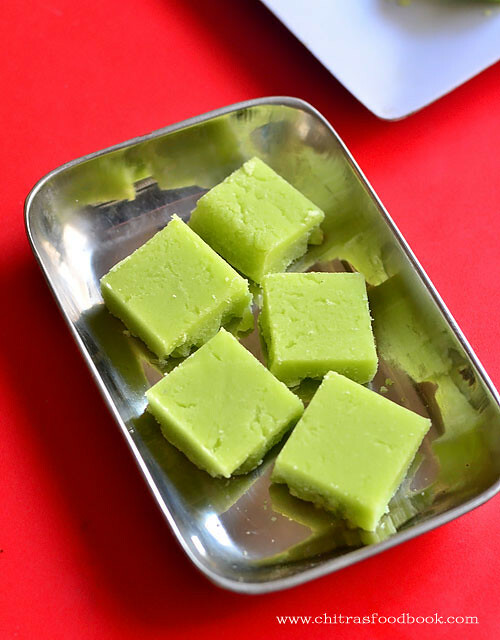 Few years back, I posted an easy maida burfi with milk powder without using ghee during Diwali. Today I have shared my MIL’s version of maida burfi which has melt in mouth texture and tastes great. This is a beginners sweet that gives fool proof results if you use good conditioned non-stick pan. It can be made with simple ingredients that are easily available at home like maida, sugar, ghee and cardamom powder. I have used green food color as we see in sweet stalls. But my MIL never uses food color. So this burfi comes out pale white without adding food color. Addition of food color is purely optional. 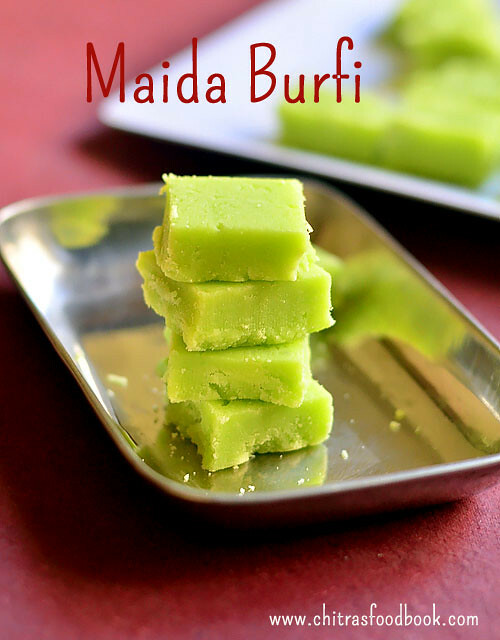 If you are looking for an easy burfi recipe to try for this Diwali, you must try this maida burfi. I am sure anyone can make it easily and perfectly. I have made a full video recipe to help beginners. Hope you will try it and share your feedback with me . Once you make it perfect, you can easily make chocolate maida burfi. I will post that recipe next week. 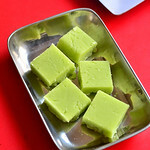 Ok, lets see how to make maida burfi recipe with step by step pictures and video ! katri are my other suggestions. 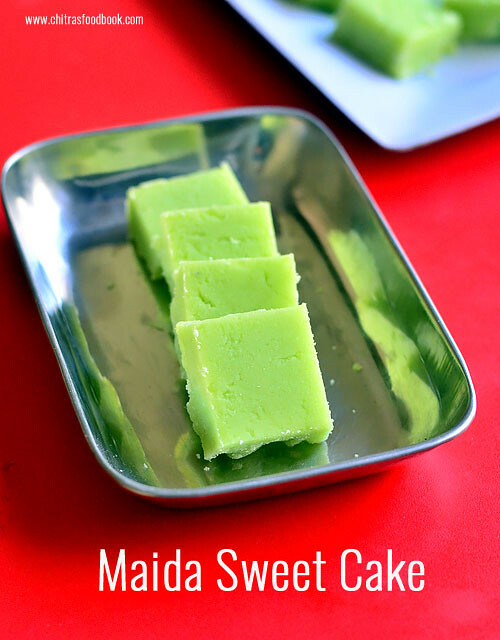 Do check out my Maida sweet biscuit which is also a beginners sweet ! Heat ghee in a good non-stick pan and roast maida till nice aroma wafts. In another non-stick pan, melt sugar adding water and boil till 1 string consistency. Switch off the flame. Add food color and cardamom powder to sugar syrup. Mix well and add roasted maida paste.Keep mixing without fire. Mixture becomes thick and starts to leave the sides of pan. Remove and spread in a greased tray.Level it and make pieces when warm.Remove after it cools down. Remove after it cools down. Store in a box. Stays good for 10 days! Heat 1/4 cup of melted ghee in a non-stick pan.Add maida/all purpose flour and roast in medium flame without burning it. It becomes a smooth paste leaving a nice aroma. Remove the pan from the flame and keep aside. No need to remove the maida paste from pan. In another non-stick pan or kadai, melt 1 cup of sugar adding 1/2 cup of water. Stir well and melt the sugar completely. Scrape the sides as well. Boil the syrup in medium flame till frothy. Lower the flame completely and check for one string consistency. To check it, take little syrup in your pointer finger from the back of ladle and slide it between your thumb and pointer finger.When you release the fingers, you will get single thin string without breaking. If it doesn't form one string, boil the syrup for one more minute and check it again. Switch off the flame. Add food color and cardamom powder, mix well and remove the kadai from stove. Add roasted maida paste and mix well without lumps. Initially the mixture looks watery but when you keep mixing, it thickens and becomes a paste. It starts to leave the sides of pan and becomes thick but pourable paste. As soon as it becomes a thick paste, remove from the kadai and spread it in the ghee greased plate OR a bowl lined with butter paper.Do not wait to become thick dough. Use a square shaped plate or bowl to make uniform pieces.Immediately spread the burfi mixture with a ghee greased bowl. Press it really well and seal the cracks if any using your fingers . Act quickly before it sets completely. Let it rest for 20 minutes to become warm. Invert into a plate. Remove the butter paper. Then cut into square shapes with a sharp knife greased with ghee. Remove the pieces after its cooled completely.Store in an air tight box and enjoy for one week to 10 days. Do not reduce or increase the quantity of sugar and ghee. Burfi becomes hard if the sugar or ghee is reduced. It will become too soft and break if you add more ghee or sugar. So please follow the same measurement. One string consistency is most important for this burfi. If you are unable to check it, just boil the syrup till frothy and pour it using a ladle. The last drop falls slowly by forming a string. This is also an indication for one string sugar syrup. You should add the roasted maida only after switching off the flame. Heat of the kadai is sufficient for the mixture to thicken. Remove the burfi mixture as soon as it becomes thick and pourable. Do not wait for the paste to become thick dough. Burfi will get more cracks. 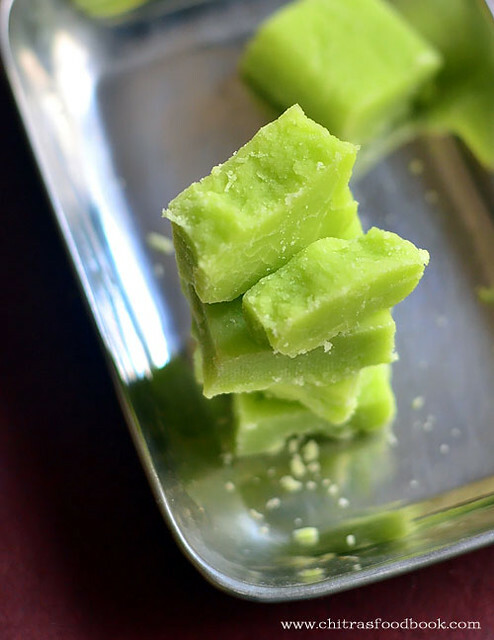 Try this easy, yummy melt in mouth Maida burfi for this Diwali and enjoy the festival !